The fire agate cab is surrounded by a silver bezel. I like to browse through books on antique jewelry to get ideas for things I would like to make from lapidary materials that I treasure. 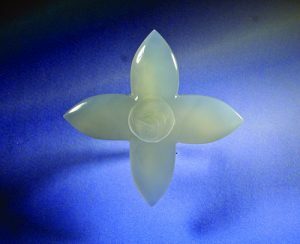 I came across a pendant with an open area in the shape of a four-petaled flower. I wanted to recreate the piece from my current favorite ma­terial: milky chalcedony. 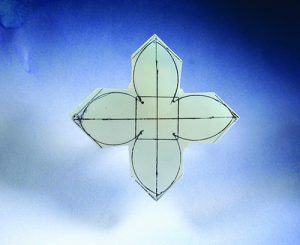 It takes considerable time to do the layout because the individual petals must match rather closely. 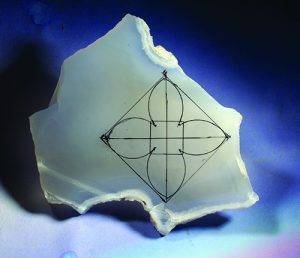 I drew the pattern onto the rough slab with a ballpoint pen: first, a square, then a line from each corner to locate the center. These lines form the centerlines of the petals. I drew a small box to locate the meet point of the petals, then used an oval template to draw in the petal lines. Considerable time is needed to do the layout, because the individual petals must match rather closely. I trimmed away the excess material. When using the trim saw, you have to remember that the lower edge of the blade cuts farther in than the top edge. I cut a little, flip the slab over and trim in a little so that I don’t overcut. The grinding stage can mostly be done on the edge of the grinding wheel. Look closely as you grind to ensure that the petals match closely in shape. Because the bottom edges of the petals curve inward, the grinding wheel won't reach this area, so you will have to use a 1-inch V burr wheel. I dip the piece into a shallow tray of water as I am using this burr. For most of the sanding on the sides and domes of the petals, I use an 8-inch, moderately used expanding wheel with a silicon carbide belt. I slide the belt about 3/16 inch off the side of the wheel. This edge of the belt will reach all the way into the V shape between the petals. By cutting a little, flipping the slab over, trimming in a little, and repeating, I don't overcut. reach the remaining areas between the petals with small, V-shaped, wooden wheels in a flex shaft handpiece. I wet the wheel and apply a thick slurry of polishing paste to the wooden wheel. A few minutes with this wheel will finish the polishing steps. 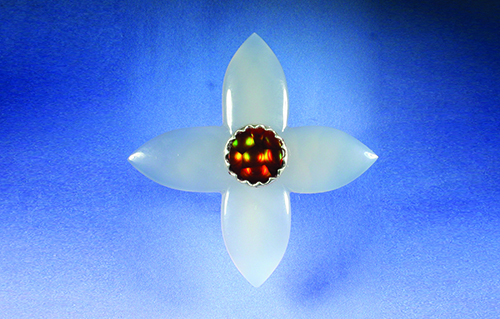 It took a while to decide what stone to mount in the center of the flower. I came across a fire agate cab that had I cut about 35 years ago. The original piece was rather thick, so I had split it down the middle. One side had a domed pattern of color spots and the other had concave spots. I had mounted the domed piece in a ring, which I sold. This remainder had sat waiting all this time for the ideal setting as the center of the flower. Using small diamond points, I recessed an area in the carving to mount the cab, which is surrounded by a silver bezel. The finished piece came out rather well. Using small diamond points, I recessed an area in the carving to mount the cab.